As mobility scooter safety continues to remain a hot topic in the industry, two award-winning mobility firms are collaborating with local authorities to run a scooter safety day for new and existing mobility scooter users. Mobility scooter supplier TGA Mobility and retailer TPG DisableAids are working together with support from West Mercia police force and Hereford Council to host the local mobility scooter safe driving day on the 22nd May 2019 from 11am to 3pm at TPG DisableAids’ headquarters. Aiming to improve users’ confidence and independence, the event will offer an enjoyable opportunity for individuals to test drive a mobility scooter for the first time or improve existing driving skills on a specially designed course that simulates obstacles that drivers may face on a daily basis, such as kerbs, road crossings and parked cars. Specialist advisors will be on hand to guide visitors around the obstacles and relevant parts of the Highway Code will also be explained to provide owners with a greater knowledge when negotiating pedestrians and other road users. Recently at TGA Mobility’s inaugural Dealer Day in Bristol, the company unveiled its new joint safe driving awareness days programme, offering retailers the chance to host their scooter safety days with support from TGA as part of its new dealer outreach initiative. “Our latest safe driving day highlights TPG’s ethos in a fun and free experience – offering vital awareness and product advice to a wider audience. This event is not a driving test, it is simply a relaxed test drive opportunity for locals to try a scooter in a safe and controlled place. We are delighted to be supported by the council and police who both share our commitment to road safety,” added Alastair. Alongside guidance around obstacles and the Highway Code, the mobility firms will also give advice and demonstrations regarding manoeuvres such as reversing, as well as the opportunity to test scooter suspension, steering, braking and controls. 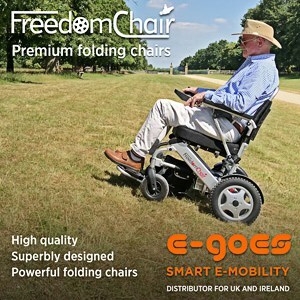 For potential owners, this is vital for appropriate product selection as there are many different types available ranging from car boot designs to larger scooters says TGA. By physically test driving a scooter, visitors can assess suitability for their needs, whilst existing owners who attend the event will gain a greater understanding of their product and personal driving capabilities. In addition, each person who completes the test track will receive a ‘Safe Scoot’ certificate and a free ice-cream. At the event will also be a range of exclusive product offers available confirmed TGA Mobility, as well as a live outside broadcast by Like Radio.